With such a variety of areas to explore in this beautiful country, you may be thinking, how can I possible choose just one? My not try the Bay of Islands? With so many different options for towns to visit and explore, there are many hidden treasures waiting to be explored. Venture through old mining villages, dense forest to pristine beaches, all within 4 hours of one of New Zealand’s most bustling cities. This post will explore the best route to take to the Bay of Islands from central Auckland with links to different itineraries based on your chosen destination. Note: For our overseas visitors, be sure to take your time when driving in NZ. Our roads are often narrow and windy so it can be more tiring for the driver to drive three hours in NZ than it would be to drive three hours somewhere where the highways are long and wide. This inland route from Auckland reveals some of New Zealand’s most beautiful hidden attractions. 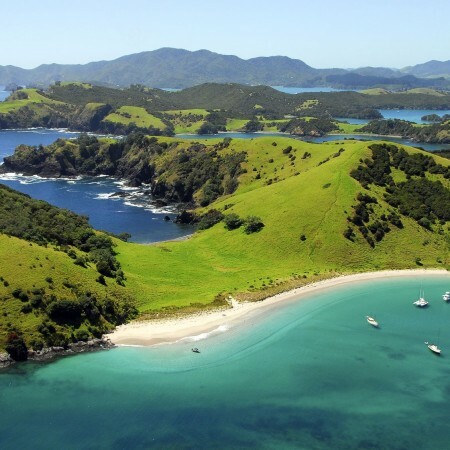 The Bay of Islands is an easy 3 hour drive North of Auckland via the east coast highway. To exit the hustle and bustle of busy Auckland, take Highway 1 North for 2 hours to Whangarei where you will continue on Highway 1 to Kawakawa. But let’s not take the direct route. If it’s your first time to this region, it is absolutely worth taking a few detours. Firstly, at 1 hour 35 mins, turn off the main road and take a look at Waipu. A quirky little Scottish town that hosts the biggest little museum in New Zealand. You will hit the 2 hour mark as you head into the largest town in Northland, Whangarei. There is now a bypass if you’d prefer to skip the town entirely, however with so many cafes and restaurants to choose from, Whangarei is a great place to stop for a bite to eat and a rest before journeying onward. If a cafe lunch doesn’t sound like your cup of tea, why not take a picnic to nearby Whangarei falls? Hikurangi at 2 hours and 15 minutes is a sleepy little town known for its old world charm and unique surroundings. Stretch your legs with 15 minute walk around the Waro Limestone Scenic Reserve. Maori culture abounds at Ruapekapeka, the site of one of the most infamous and confrontations between the Maori and Europeans during the years of settlement. Take a turn off just after Towai. This attraction is free and will only add 15 minutes to your trip. Welcome to Kawakawa! At 2 hours and 45 mins away from Auckland, you’ve made it to the gateway of the Bay of Islands. This quirky town is an attraction all of its own. Visit the Hundertwasser Toilets. If you’re lucky, you may even see the old steam train passing through town. You can click on the little star next to where it says Bay of Islands at the top of the map. This will save it to your Google Map (You will need a Google Account for this). Scroll across and click on the Maps tab and you should see Bay of Islands there. Click on it and it’ll load the directions onto the map for you. Now when you are in the Menu you should see Bay of Islands just above the Traffic option now. You can use the slide next to Bay of Islands to show you the map legend where you will be able to choose which way you want to take.